Read the Toyota Verso-S MPV (2011 - 2013) car review by Auto Trader's motoring experts, covering price, specification, running costs, practicality, safety and how it drives. The Toyota Verso-S is a spacious city car designed to compete with the Honda Jazz, Vauxhall Meriva and Nissan Note. It's economical and well equipped. Interested in buying a Toyota Verso S? Its manufacturer classes the Toyota Verso-S as an MPV, so it’s no surprise that it’s quite tall and narrow. It’s also the shortest car in its class, so the overhangs front and rear are very short, giving the car a purposeful look. The Verso-S also looks very modern, with lots of sculpting, sharp angles and tight shutlines. Because Toyota is selling mainly high-spec versions of the Verso-S in the UK, it also looks a very high-quality product, thanks to the standard fitment of alloy wheels and privacy glass in range-topping trim. It is designed to take Toyota head-to-head with the Honda Jazz, Vauxhall Meriva and upcoming Ford B-Max, but unlike the last two it has conventionally opening side doors. The interior of the Verso-S is a mixture of good and bad, as there isn’t much flair in evidence as far as the overall design is concerned. However, the materials are all of a high quality, the fit and finish is excellent and everything is very easy to use. What lifts things is the panoramic glass roof fitted as standard in T Spirit trim – this really opens up the interior. Another nice feature is the standard large touch-screen display in the centre of the dash, which allows you to adjust key settings while it also displays trip information. This is where Toyota’s claims of the Verso-S being an MPV don’t withstand scrutiny, as there’s little in the way of versatility. The rear seats don’t slide or remove for example, but they do fold forward with a 60/40 split – and a nice touch is the lever just inside the boot which allows you to fold the seat backs forward without having to open the side doors first. The boot floor can also be adjusted to sit flush with the load lip or it can be lowered – but you can’t have a split-level boot floor for ultimate practicality. Rear seat leg room is excellent with the front seats set forward, but if you’ve got tall people in the front there won’t be enough leg room in the back to accommodate anyone who is above average in height. As a micro MPV, you can’t expect too much in the way of driving pleasure from the Verso-S. However, Toyota’s engineers have made the right call in terms of how the suspension has been set up, because it’s surprisingly comfortable considering its short length. Despite being able to cope so well with broken surfaces, the Verso-S doesn’t wallow all over the place on bends. The electric power steering is extremely light, making manoeuvring a synch, but it lacks feel for the road below. So while the Verso-S is very competent dynamically, predictably, it isn’t a car that offers genuine driving thrills. If you enjoy driving the Jazz and Meriva are more fun on a twisting road. There’s only one engine available in the Verso-S, a 98bhp 1.33-litre petrol unit that comes with either a six-speed manual gearbox or a seven-speed CVT automatic transmission. The manual gearbox is pleasant enough to use, but for some reason Toyota’s engineers have produced a transmission that keeps the engine revs very high when cruising at speed. The CVT option allows for much more relaxed cruising, so it’s no surprise that two-thirds of Verso-S buyers choose this gearbox over the manual. Opt for the manual gearbox and there’s a 106mph top speed with 0-62mph coming up in 13.3 seconds – choose the CVT instead and the equivalent figures are 103mph and 13.7 seconds. We mainly drove the Verso-S in South West London, where CVT offered a decent mix of stress-free traffic driving and bursts of acceleration up to 30 or 40mph. The Verso-S should be one of the cheapest small cars to run, as Toyotas tend to hold onto their value pretty well. 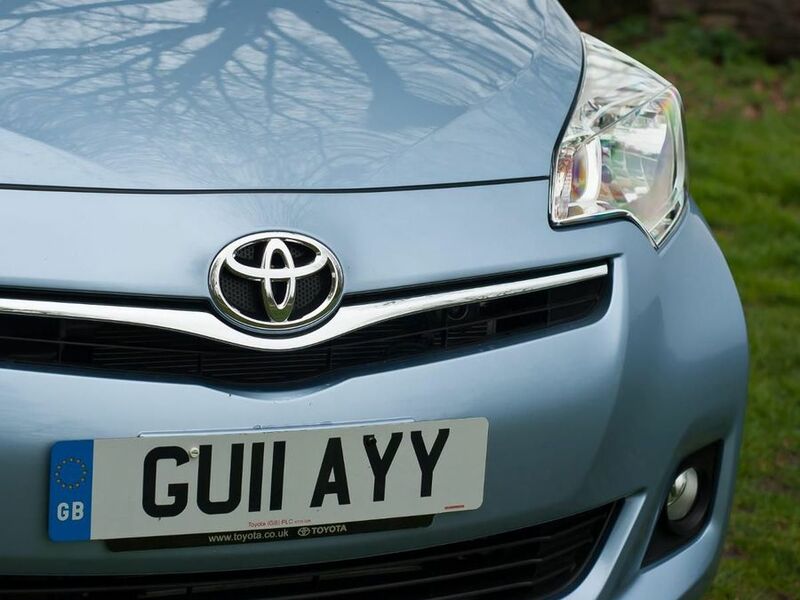 This is helped by the fact that Toyota aims to sell little more than 3,000 examples of the Verso-S each year in the UK, so demand should exceed supply rather than the other way round. The Verso-S is also very economical, as it can average 51.4mpg in manual form (with CO2 emissions of 127g/km) while the CVT edition can achieve 54.3mpg with CO2 emissions of 120g/km. It’s a shame there’s no stop and start technology, however, and Honda have now introduced a Jazz Hybrid managing 62.8mpg and 104g/km of CO2 emissions. Toyota has an excellent reputation for reliability, and while that reputation has taken a bit of a knock due to a series of high-profile recalls, the quality of its cars is still towards the top end of the market. The Verso-S never missed a beat during more than a week of driving with out testers. As you’d expect, the Verso-S comes with a wide range of safety kit as standard, including driver and passenger airbags, curtain airbags, a knee airbag for the driver and Isofix child seat mountings in the rear. Everyone gets a three-point seat belt, while brake assist, traction control and electronic stability programme (ESP) are fitted to all cars. How much equipment do I get? Verso-S buyers can choose between two different trim levels – TR and T Spirit. Even the entry-level model comes with a good range of standard equipment, such as electrically adjustable door mirrors, electric front windows, the touch-screen display with reversing camera, air-con, Bluetooth and a multi-function steering wheel. Move up to the T Spirit and also included are the panoramic glass roof, alloy wheels (the TR has steel items), rear electric windows and privacy glass for the rear side windows. Although the Verso-S isn’t as versatile as its MPV tag might have you believe, it is practical, economical, well built and well equipped too. It should also hold onto its value pretty well, and it’s not over-priced in the first place, although rivals such as the Kia Venga and Hyundai ix20 are better value.